Today, GateHouse Sober Community participates in Black Balloon Day to help remember those who have been lost to the drug epidemic. People are encouraged to tie a black balloon outside their homes or businesses to help raise awareness for the cause. Our rehabs in NH are proud to be a part of this special day. Diane and Lauren Hurley lost a son-in-law and a brother-in-law when Greg Tremblay, father of four, died of an overdose on March 6th, 2015. He was 38 years old. In remembrance of Greg Tremblay, the ladies began Black Balloon Day, which has grown into a national event, bringing awareness to overdose deaths. The opioid epidemic ravaging the country has taken over 100,000 lives in just the past two years. According to the CDC, more than 80% of the total U.S. overdose deaths in 2016 were related to opioids or synthetic opioids. The numbers are staggering, and even worse, they don’t seem to be slowing down. Overdose deaths have surged in the past few years breaking records. This rising death count is attributed to the introduction of a deadly and illicitly manufactured drug called fentanyl, which is a synthetic opioid. Something drastic needs to be done, and we can’t wait for someone else to do it. The community needs to unify together and take impactful action. This is the goal of our rehabs in NH. Causes like the Black Balloon Day, that have picked up traction on social media platforms get people to look, learn, and ask questions. With overdose deaths at an all-time high, most of us have lost someone or know someone who has been impacted by and overdose death. Several reports suggest that a lack of awareness and knowledge is a critical factor in many otherwise preventable overdose deaths. Without a national awareness campaign in place to educate the public about the signs and symptoms of opioid overdose and addiction, we must work as a community to bring awareness. 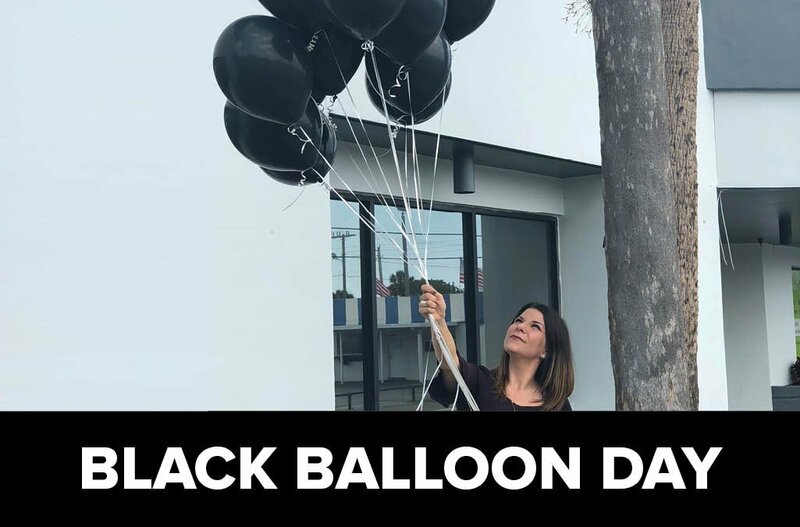 With social media platforms so readily available to everyone, making awareness campaigns that much easier, participating in events like Black Balloon Day are vital to spreading an important message. Not only are we creating awareness, but by educating the public and individuals publicly showing their support for the cause, we as a community are working towards improving the stigma associated with addiction and overdose. Only once we are able to bring about community awareness and reduce stigma are we then able to ensure the opioid epidemic is at the forefront of policymaker’s agendas. According to the National Survey on Drug Use and Health, more than 21.5 million American adults battled addiction in 2014. These numbers have only increased in the last 4 years. With more young individuals being addicted to drugs and alcohol than ever before, its become a time sensitive matter to make treatment options more readily available. Addiction treatment helps individuals stop using drugs, continue staying drug-free, and allow them to be productive in their families, at work, and in society as a whole. While rehab centers can help addicted individuals stop using drugs, and maintain enough sobriety to begin reintegrating into society, treatment only lays the foundation for life-long sobriety. The rest of the work to continue staying drug and alcohol-free is done through 12-step programs, or rehabs in NH faith-based programs that allow individuals to rebuild their lives and have coping techniques to handle life stressors and stay clean. While the message stings, it’s the reality for addicted individuals today if no action is taken. We encourage you to share a photo of your balloon using the hashtags #BlackBalloonDay and #ParticipateInRecovery to show you stand with us. Take action. Participate in recovery. It could save lives. For more information on addiction and rehabs in NH, please contact Gatehouse Sober Community today!